"I'm having a Princess Cake!" My daughter, for her 3rd birthday, knew she was going to have a princess cake. She was so deep into the Disney Princess movies. I knew she was going to have a princess cake, but I didn't know how she was going to get it. I had already made the "Princess" Cake for my best friend earlier in the year. I also knew I wanted to make Cinderella's carriage for her. But how was I to do it? Once again, I pulled out my Betty Crocker Bake 'N Fill dome cake pan. This is another cake where, in hindsight, I should have used a more dense cake batter. I had one Bake 'N Fill dome on top of another to create the "carriage" and the weight of the cake started to make the whole thing "sink". Luckily, we got through the party and ate that cake before it started to LOOK like something was going wrong. 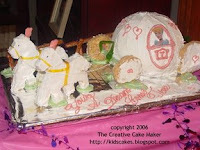 The horses and carriage wheels are made with Rice Krispies treats I cut out into horse and wheel shapes. To make sure they would stand up, I anchored them in melted Wilton green candy wafers. Then I sprinkled the candy with decorating stars while it was still warm. This was to resemble flowers on the path. I did the same thing to anchor the wheels, fence, anything, besides the cake, that was going to be standing up. To make the writing, I typed out the words in a font I liked on the computer and made them the size I wanted. After printing it out, I placed a sheet of wax paper on top of it and traced the letters with pink melted Wilton candy melts (Place the melted wafers in a Ziploc bag and cut a hole in the corner). After the candy hardens, you can remove the letters gently with a spatula and place wherever you want. It is my daughters 3rd Birthday as well...I'm gonna give this one a go! Thanks for the idea!